I sold my practice in 2007 and I’ve been lucky enough to have the opportunity to be able to dedicate my time to volunteering. Monarch School was put on my radar through the San Diego County Optometric Society, where I serve on the board. For the last five years, I’ve participated in the effort to bring access to eye care for these students. It started with Sight for Students gift certificates, provided by VSP through the California Optometric Association, which covered an eye exam and eyewear but, due to transportation barriers, I would see student months later and some still hadn’t been able to even get to an appointment for an exam. Getting the VSP Mobile Eyes clinics here has been truly impactful. Now I know that we are in essence closing the loop and getting the care and eyewear to the children that need it the most. This is why I got involved – to make a difference in the lives of extremely deserving students. It always felt good to be a part of a network of professionals within an organization that did so much for communities in need, especially for disaster relief. Hearing of VSP’s one million celebration, I can’t help but to feel like a small part of it, but a proud part of it. I love being able to see them receive something that you know for a fact is going to help them tremendously. Kids can often be labeled as a trouble makers or low performing in the classroom when really the case is that they just cannot see clearly. As a professional optometrist and especially if you own your practice, you’re focused on the care you’re providing within that space, paying the bills and establishing yourself. Often times volunteering is not made a top priority; but now I think back and it wouldn’t have been hard to take a day to do work that makes such a difference. It takes a little mentoring, but I always encourage our board members and young professionals to take the time whenever possible. It will give you appreciation for your day-to-day much more. I have a history of having worked with prisons and many inmates were essentially doomed to fail because of their eyesight. I came across men that were 40-years-old and extremely far sighted and it was never caught in the school system. Issues of astigmatisms or being nearsighted reveal themselves in more obvious ways in the classroom than problems associated with being far sighted. Children can often compensate for this issue but definitely not for long. 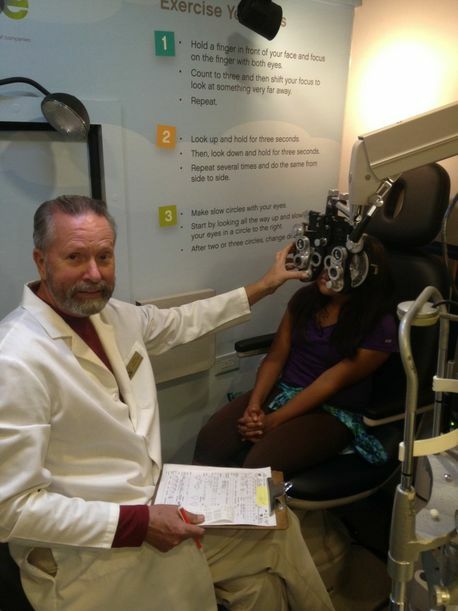 This is why in school screenings and annual comprehensive eye exams are so crucial. To me, seeing clearly is also seeing comfortably, being able to realize your full potential, but even more importantly, to live life to the fullest without any discomforts. I am happy that I am in a situation professionally where I can do this kind of volunteering that I know makes a difference. As long as I have the time and energy, I will continue to help. In 1997, VSP launched Sight for Students, the first Eyes of Hope initiative, to ensure that school-aged children had access to quality vision care. 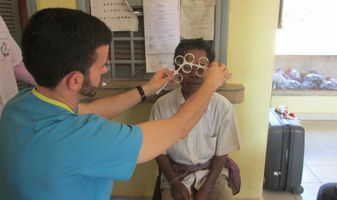 Today, VSP Global Eyes of Hope has evolved and expanded to support communities around the globe through initiatives that bring access to eye care, eyewear, education, and disaster relief to places where they’re needed most. This month, VSP is celebrating a big milestone: providing one million people in need with no-cost eye care through Eyes of Hope programs, including Sight for Students and VSP Mobile Eyes. On March 28, VSP Mobile Eyes will visit Monarch School in San Diego to provide no-cost eye exams and new glasses to their students. Monarch School is a K-12 school, run as public-private partnership that offers a comprehensive education alongside social services designed to help students impacted by homelessness. VSP Global President and CEO Jim McGrann appeared on Dr. Gary Gerber’s Power Hour radio show for the fourth time on Wednesday, ... read more.